The Nobel Prize-winning playwright and proud socialist George Bernard Shaw has been making us laugh and think since the mid-1800s. His impressive facial hair isn’t the only thing that still resonates today. Don’t miss his funniest play! 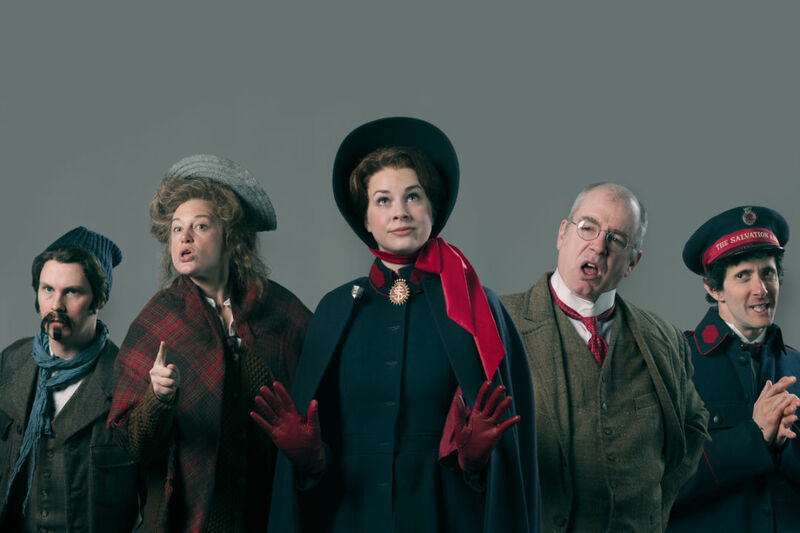 Meet the characters of Major Barbara: (left to right) Chris Murray as Bill Walker, Dana Green as Rummy Mitchens, Hanley Smith as Barbara Undershaft, Charles Leggett as Andrew Undershaft and Brian Weaver as Adolphus Cusins. Shaw was a proud socialist and one of the very first members of the Fabian Society, the democratic socialist party of England. As an effective public speaker (partly because he was so funny), he became one of the country’s most popular political orators. With the Fabian Society, Shaw fought for child labor laws, a minimum wage, the 8-hour work day, universal health care and more. When he wasn’t distributing pamphlets and pushing political boundaries, he was a prolific playwright who used theater to wrestle with the causes of the day – often with a heavy dose of humor. Want to learn more about Shaw? Read some of his brilliant quotes – and get a glimpse of his glorious facial hair – here and explore Major Barbara here.